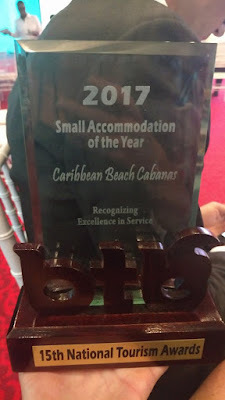 CBC is still recovering from our excitement last weekend at the 15th annual Belize Tourism Board's, annual tourism awards - we were thrilled and honored to win Small Accommodation of the Year! The BTB Awards were unbelievably well done - professional, with fantastic food, emcees, and entertainment. 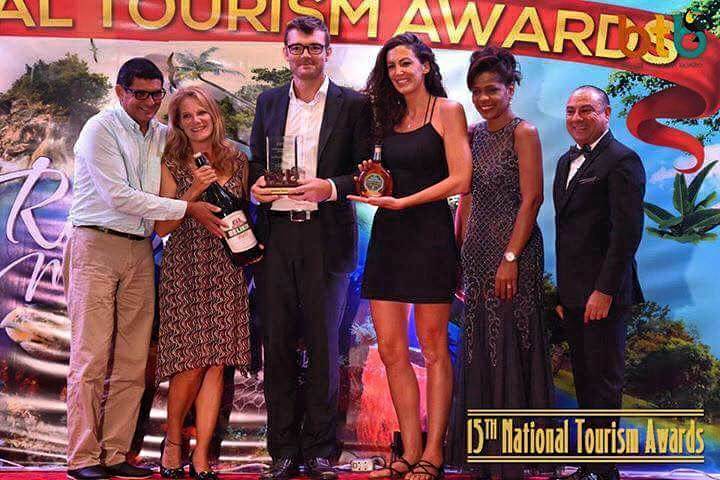 There are several categories in many areas of tourism (see below for all the winners!) 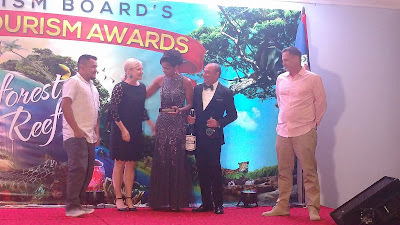 We sat at a table with the other wonderful Placencia nominees, including Pam and John of Rumfish, who won Restaurant of the Year! 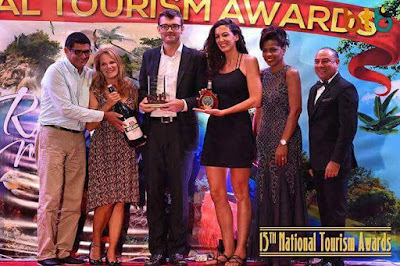 And Lyra from Taste Belize, who was nominated for Tour of the Year (she will get it next year!!!) We had a blast and we represented Placencia (loudly &) well - coming home with Best Restaurant and Best Small Hotel in the country!! Restaurant of the Year was first......here is Rumfish y Vino's big win!! Here's a link to watch Rumfish's great interview that led to their win - on their 10th anniversary year!!! 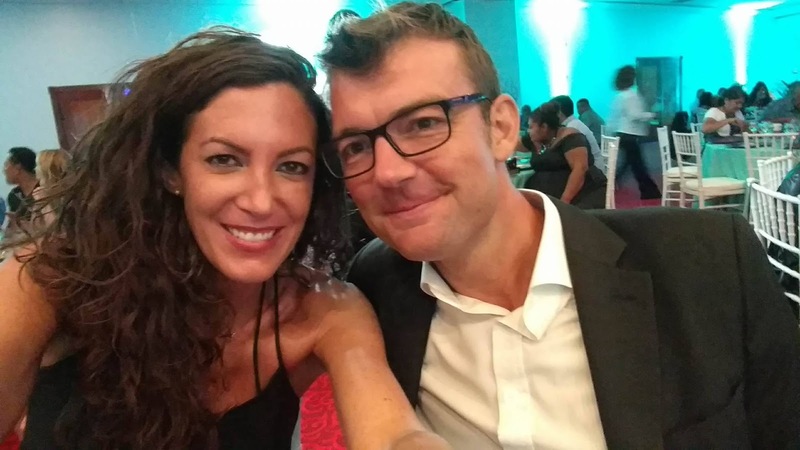 Here are Laura and Dave about 5 minutes before the announcement.....yes our stomachs were in knots. Here is the video of the win!! Here is the CBC interview that occurred a couple weeks before the ceremony...this played at the ceremony over the din of our screaming. Here are some other pictures from the night, we will never forget it!!! 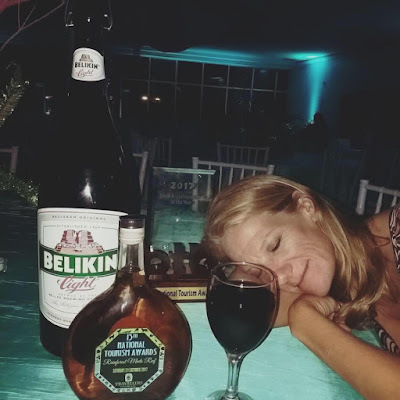 Sue, exhausted from the excitement...gotta love Belize, along with the trophy we got an oversized Belikin bottle and a bottle of rum, which are now on display at both Rumfish and CBC! Watch all the winners here! Thanks to BTB for a night that meant so much to all of us; we will never forget it. 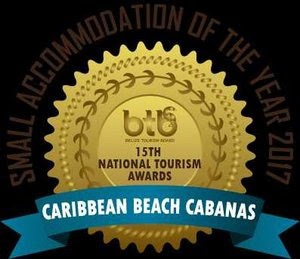 And THANKS to all our guests, whose reviews and choice of CBC and Rumfish were a big part of why we both won! 2 super cheap, easy staples to make while you are in Belize! 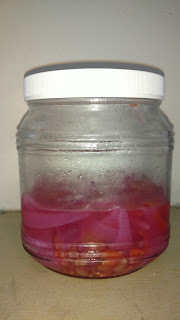 I have these two things in my fridge constantly, and they are so cheap and easy. 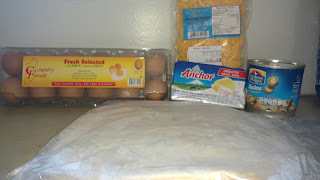 You can always find the ingredients, and even if you are here only for a few days or a week, it is nice to have some simple food in your fridge so you don't have to run out to eat every time. 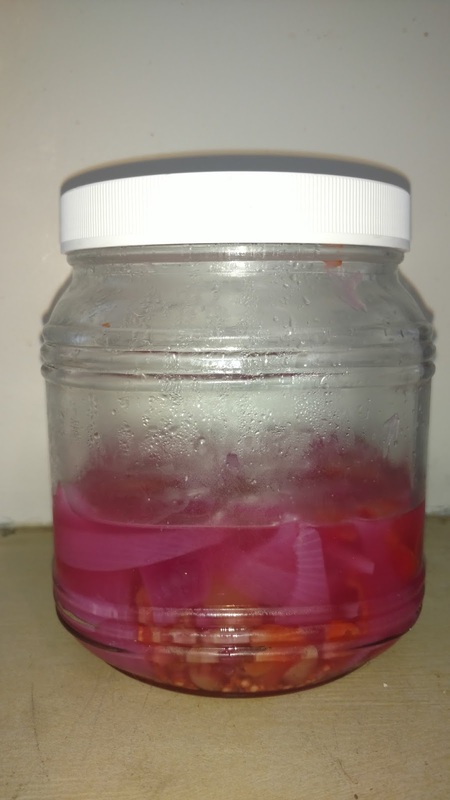 If you go to any chicken, rice, and beans stand - you will often see a jar that has (delicious) onions and jalapeno/peppers chopped up and mixed together, that you can put on top of your food. It is SO good. I put it on everything - for example, if you were just here a few days on vacation but wanted simple snacks in your room, you could put this on eggs, nacho chips, or roll a tortilla and cheese with this (see below). It makes everything taste amazing. 4 habaneros - I like it hot, but use less if you don't! Cut up the veggies to the size you like, and throw them in a saucepan with the liquids - bring to a boil, then lower heat for several minutes until the onions are a bit soft. Add sweetener to taste when it cools down, then put in a jar or container and put in the fridge. It lasts over a week. You can find habaneros at farmer's market stands. Coarsely chop and throw all this in a blender. 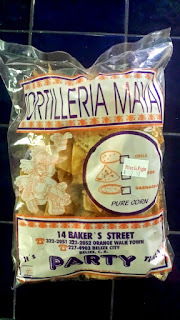 That's my favorite and most easy way to make this, but you can also chop it all up if you don't have a blender.